Unique new function: AV output and LED indicator. AV interface can be used as video output also can connect the speaker. LED indicator with the different modes of breathing, rotating and flashing which will perform in different operative mode. Support HDMI 1.4 and 1080 FHD output, you will enjoy the perfect experience. Wireless connection: Wifi display dongle support the photo, video, audio, game, file, live camera, browser and etc. from iPhone, Android, tablet, laptop to large screen TV. 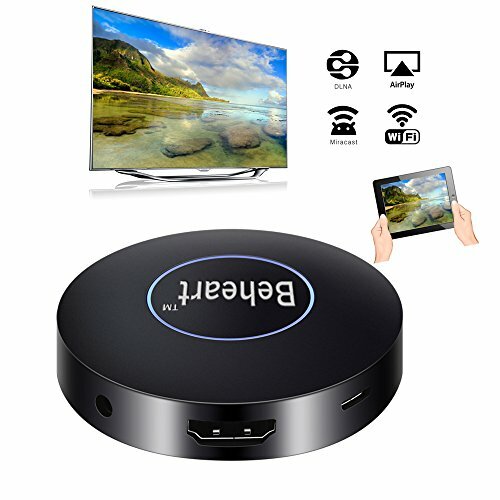 Easy to use: No APP or Driver required, just make the simple setup, then the screen of smart phone, tablet, laptop can be mirrored to HDTV, display screen or projector. Small size and easy to carry: Nice design with small size, easy to carry for business travelling. Multi supporting: such as PPT, Excel, Word, PDF and photo from the smart phone, tablet, laptop to HD TV and projector. With this all in one product, you will have a fantastic social life. Compatibility:Not compatible with chrome cast.It supports AirPlay (IOS8.0 / Mac OS10.0 or above) and Miracast (Android4.4 / Windows 8.1 or above). Synchronize the photos / videos / games / office documents / files from mobile phones, tablets and laptops to TV screen, projector as well as car screen. Support the network player DLNA Push. Note: It doesn't support the copyright protected Video Programm, such as Netflix / Amazon Video / HBO GO / Hulu Plus etc. If you have any questions about this product by BEHEART, contact us by completing and submitting the form below. If you are looking for a specif part number, please include it with your message.